Wonderful weekend to show at a UKC Show. 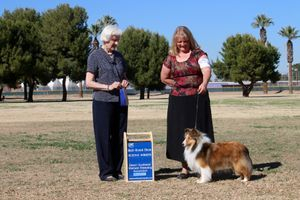 December 16-17, 2017 put on by Desert Southwest Shetland Sheepdog Club, In Phoenix, AZ. Thank you to the following Judges: Ms. Arlene Grimes, and Mrs. Judith Lehman. This win allowed Chase to become a new UKC Champion. 12/16/17. Mrs. Judith awarded Chase Res. Best in Show 12/17/17. Wonderful weekend to show at a UKC Show. 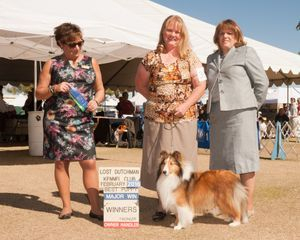 December 16-17, 2017 put on by Desert Southwest Shetland Sheepdog Club, In Phonix, AZ. Mapleleaf I Have One Question "Missy" was awarded Best Female at 4 shows. She is now UKC CH Mapleleaf I Have One Question "Missy". AKC Show 2/7/16 Chase is Winners with a 4 pt major, puppy and Owner Handler wins. They came home with 3 first and 1 second showing in 9-12 month puppy class. The following information below is about Allie and her Daughter Halo. sable & White girl and a tri color boy. way tie for 2nd place, speedier dogs gave her the 4th place out of 15 dogs. Halo will be simmering through the winter and trying for her new title in St.
Louis in April of 2014.
two more to go Thanks Debbie for switching days with me!! know what we need to work on. Faron X CH Rosmoor Redemption) Allie is being a very attentive mother. be a tri looking forward to raising and training my "molded from birth"
performance girl. ? with Ashley Lynn Miller. not going, but it's awesome that she is eligible!! She is a fun loving girl and captivated judges with her joy and zest for life! a second place. I'm so proud of her!!! ? at Providence Kennel Club. time!! This time there were 15 dogs in the class. ? at W. Springfield MA . 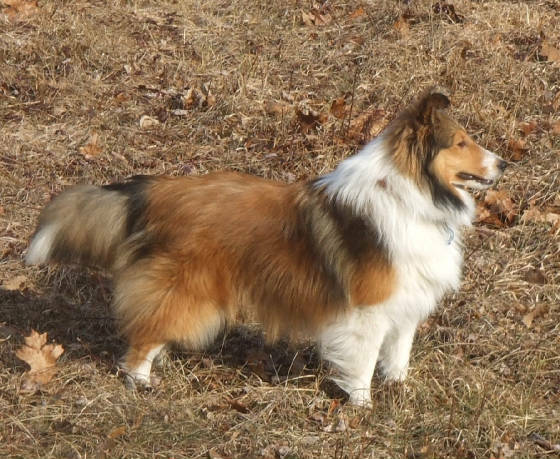 April 15, 2012- Allie made her Rally Novice debut today at the Rhode Island Kennel Club show.